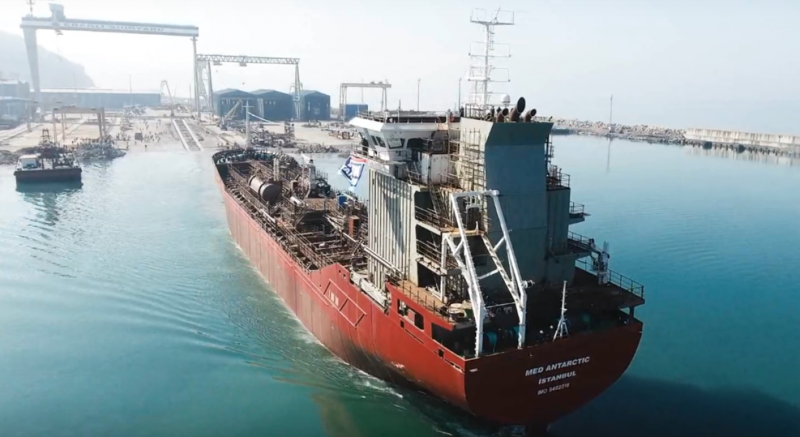 The construction of the chemical/oil tanker Med Antarctic (Eregli 30) started on February 2016, and a year after on 30th of March 2017, we are celebrating its successful launch! Med Antarctic is a 8400DWT IMO type II chemical/oil tanker measuring 123,9m x 17,2m. The tanker is powered by a powerful MAK/8M32C main engine developing 4000 KW at 600 rpm. In addition, Nitrogen Gas Generator system is designed so that to fill 5% ullage volume of all cargo tanks and slops tanks at the same time (padding) is possible. The vessel is a single screw, double hull vessel, which is capable to carry the cargo a large range of liquid cargoes IMO II type, petroleum products and vegetable oils. Cargo area is divided to 12 cargo tanks by means of oil-tight corrugated transverse bulkheads and longitudinal bulkhead in CL. The vessel is also equipped with 2 slop tanks on deck. Designation of full segregation gives the vessel high flexibility. It is foreseen that the vessel will go under YMN Tanker management at the second half of 2017.